"Greenpeace is an independent, nonprofit, global campaigning organization that uses non-violent, creative confrontation to expose global environmental problems and their causes. Greenpeace stands for positive change through action to defend the natural world and promote peace. We investigate, expose and confront environmental abuse by governments and corporations around the world. We champion environmentally responsible and socially just solutions, including scientific and technological innovation." Primarily, Greenpeace is known for its consistent in-depth investigations and spreading of awareness of these prolific issues. Their main action is their campaign against the use of coal in China, which is the main contributor to the worsening air quality, as the burning of such releases sulphur dioxide, nitrogen oxides and particulate matter. The resulting chemical compounds aid in the process of acid rain, global warming and the worsening air quality. The organisation holds the belief that the lack of energy production could be compensated by a further reliance on renewable energy, of which China already has delved quite heavily within. Wind and solar energy could make a drastic impact, considering these release almost zero emissions. In addition, Greenpeace has been campaigning for the amendment of various guidelines related towards air quality, notably the Air Quality Objectives created in Hong Kong. These are notably 20 years out of date and extremely lackluster in comparison to World Health Organisation Standards. These results create a false positive, seemingly conveying the air in Hong Kong as healthy by its own standards, when it is far from it. Furthermore, they present awareness of this situation by not simply campaigning on their website; they have built websites and apps that denotes the real air quality levels experienced in China. Remove those plants that use inefficient industrial coal-fired boilers. These reports attempt to convey that the solutions are necessary and a pivotal part of re-consolidating the quality of China's air. Whilst these actions have primarily been passive, raising awareness and promoting possible solutions, occasionally actions need to be taken to get the message across. 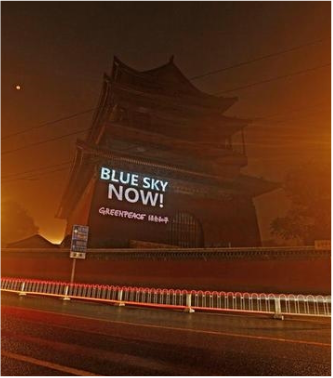 On the 10th of October, Greenpeace activists projected an image denoting 'Blue Sky Now' on the Beijing Drum Tower, in response to the staggering results measured 3 days prior. These results extrapolated that there were certain locations that contained over 15 times the acceptable limit for World Health Organisation standards, with most areas experiencing 250ug/m. In addition, Greenpeace has contributed towards the massive debate regarding the air quality within China on the social media site Weibo. After the initial hype between the data from the government and the embassy, Greenpeace was able to coerce debate towards the excessive coal consumption from the differentiations in air quality. 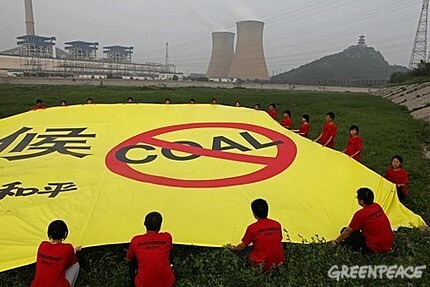 The awareness raised has helped stem protests towards the coal usage within China and forced the government to take action a few months after the discussion began. The actions of Greenpeace seem to be effective, using their profound recognition to raise the awareness of these issues. The investigation and research into these issues have effectively gauged the detrimental impacts of the air quality, thus advocating strategies that would be most effective based on their analysis. However, the scattered protests aren't clearly demonstrating to the general public that this is an impending issue. Of course, their website attempt to lobby for the immediate action against air pollution, but their limiting factor is that their only main medium is through sporadic protests or the internet, with action only viable when large masses demand change. Therefore, Greenpeace needs to be seemingly more proactive, with awareness being the primary goals towards the policy change that is required. In conjunction, whilst their investigations and reports provide great detail and information, there is limited visibility and ability to spread the awareness. In addressing the criteria, Greenpeace has prominently made informing the masses as top priority. The spreading of this awareness has been very effective, although somewhat limited, but aids in the achievement of a general consensus to solve the impeding issue. The organisation has also set-up various monitoring programs, allowing the effective locating and prioritizing of problematic areas, whilst also conveying the necessary steps towards success. Even the Chinese coal mining industry is embracing these solutions, with the slowing coal consumption mid 2013 seeing some major companies taking part in unique actions. Most notably, Shenhua Energy has been involved in a joint investment project for the construction of wind farms with Hydra Tasmania . Similarly, other leading coal industries are also moving towards renewable energy, with most capitalizing on the already prominent renewable energy industry and making the most of it. We can clearly see that these are off the back of a widespread awareness movement that has seen pressure applied for cleaner air quality, with organisations such as Greenpeace being detrimental to the cause. With few negatives, Greenpeace continues to play a pivotal role in the reduction of China's air pollution.